August 17 UPDATE: According to Sudan Sunrise, Dawod has been released and is now with his family. He is reported to be in good condition. The Sudan Tribune reported that Dawod's freedom was part of a larger release of an estimated 80 political detainees including a number of youth activists and journalists such as student activist Mohamed Alim Boshi, journalist Mohammed Al-Asbat, and Usamah Mohammed, an active twitter user who was arrested during the first days of the Sudan protests. Releasing these 80 prisoners is a positive step for the government of Sudan, but it is important to note that the majority of political detainees who were arrested during anti-government demonstrations have not been freed and remain in custody. Just as loved ones and supporters began to celebrate the release of Sudanese activist Rudwan Dawod on August 13, Sudan’s National Intelligence and Security Services, or NISS, re-arrested Dawod and took him to an undisclosed location. A judge in Khartoum acquitted Dawod of the most serious charges against him—including terrorism and criminal organization—which, in Sudan, could have resulted in the death penalty. The judge found him guilty, however, of “attempting” to disturb the public peace, which included the punishment of a small fine and a jail sentence limited to the time Dawod has already served. Immediately following his release from custody, Dawod was ushered by the NISS into a police vehicle outside the courthouse. According to Girifna, the NISS ordered the transfer of Rudwan to NISS custody without pressing any charges, which is legal under Sudan’s Public Order Law. This latest development in the Dawod case is particularly concerning because it signals the NISS’s complete disregard for human rights and the decisions of Sudan’s judiciary. Furthermore, it evidences the government of Sudan’s willingness to commit blatant human rights violations, even with high-profile cases, as it attempts to cling to power amid growing opposition. Following his arrest on July 3, Dawod’s brother and father were arrested in their home and pro-government newspapers in Sudan began to publish claims that a terrorist cell had been arrested. 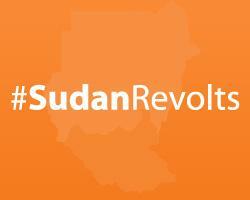 This falsification of information has become a hallmark of the state-controlled media in Sudan. Arbitrary arrests and detentions, such as Dawod’s, have also become commonplace. Since the latest wave of protests began in Khartoum on June 16, more than 2,000 activists have been detained, according to Girifna. Sources have reported that Dawod has been subject to torture and abuse during his detention, which raises serious concerns for his safety and for the safety of other political prisoners. Since July 3, Dawod’s arrest has received high-profile media attention including a feature on Nick Kristof’s New York Times column. Dawod, who grew up in Darfur but became a U.S. resident in 2010, often travels to Sudan and South Sudan as the project director for Sudan Sunrise, an organization dedicated to building schools in South Sudan and working to facilitate reconciliation efforts to ensure lasting peace in Sudan and South Sudan.